Start off your visit on the 16th (Sat): surround yourself with nature on a nature and wildlife tour, then make a trip to LUVATTUMAA - Levi Ice Gallery, and then enjoy some diversion at Kid's Land. To see more things to do, photos, ratings, and more tourist information, you can read our Levi journey planner . London, UK to Levi is an approximately 10-hour flight. You can also drive. The time zone changes from Greenwich Mean Time to Eastern European Time, which is usually a 2 hour difference. Traveling from London in November, expect Levi to be much colder, temps between -3°C and -11°C. Wrap up your sightseeing on the 16th (Sat) to allow time to travel to Inari. Start off your visit on the 17th (Sun): get a dose of the wild on a nature and wildlife tour, pause for some serene contemplation at Pielpajarvi Wilderness Church, and then see the interesting displays at Siida. To find ratings, traveler tips, more things to do, and other tourist information, use the Inari online tour itinerary planner . Fly from Levi to Inari in 3 hours. Alternatively, you can drive; or take a bus. In November, plan for daily highs up to -3°C, and evening lows to -10°C. 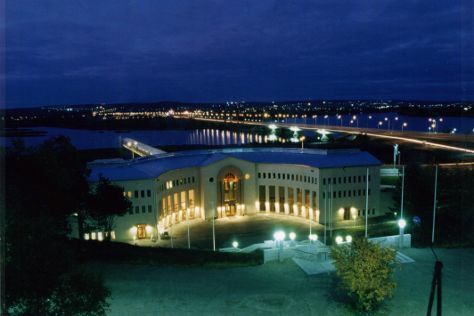 Wrap up your sightseeing on the 17th (Sun) to allow time to drive to Rovaniemi. Start off your visit on the 18th (Mon): snap pictures at Lumberjack's Candle Bridge, then take an in-depth tour of Arktikum, then see Santa Claus Office, and finally find something for the whole family at Santa Claus Village. For maps, ratings, traveler tips, and tourist information, use the Rovaniemi road trip planner. You can drive from Inari to Rovaniemi in 4 hours. Other options are to take a bus; or fly. November in Rovaniemi sees daily highs of -2°C and lows of -7°C at night. Cap off your sightseeing on the 18th (Mon) early enough to travel back home.